The Aluminum Super Folding Stairway is designed for a 30" by 54" rough opening to make possible wider, easier access to roof areas. Where 16" O.C. ceiling joists are used, simply cut one joist and put in headers. Piano-hinged in its own steel frame for a 30" X 54" rough opening up to 10'-0" and 30" X 64"
for over 10'-0" finished ceiling heights. 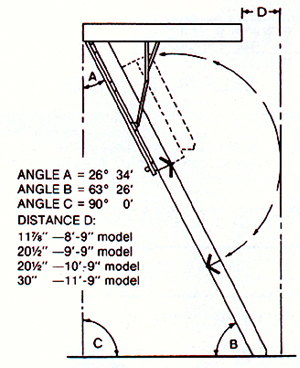 Height of the 1/8" steel box frame is 5" when using aluminum door panel. Non-skid covered treads have risers of 9 1/2". Unit is 500 lb. tested. Steel handrail on door-panel section. Stairway is operated via operating pole (included) with hook on one end to engage "eye" on the underside of the door panel for both opening and closing. 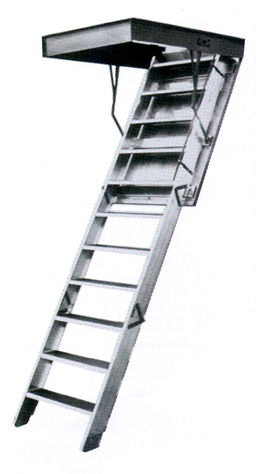 Available for heights up to 12'-0" using either door.